A ring crafted from silver. This is a distinctive rectangle men's ring, featuring a striking onyx square at its centre, finished with a matt and polished pattern. Simple yet distinctive, this ring offers bold sophistication. 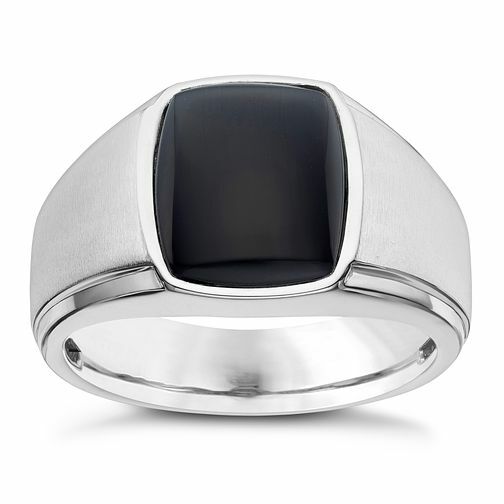 Silver Rectangle Onyx Ring is rated 4.0 out of 5 by 1. Rated 4 out of 5 by Anonymous from Stylish, smart and wonderfully crafted. Despite some problems with the delivery process this ring was the perfect gift! Really modern and stylish, crafted well and true to the pictures online - very pleased. As a warning: The ring came up a little larger in sizing and is quite thick/chunky and therefore someone with hands on the smaller scale may find they cannot close their fingers together (but was ideal for what I was looking for and we did not have this problem). Worn on middle finger. Worth every penny!